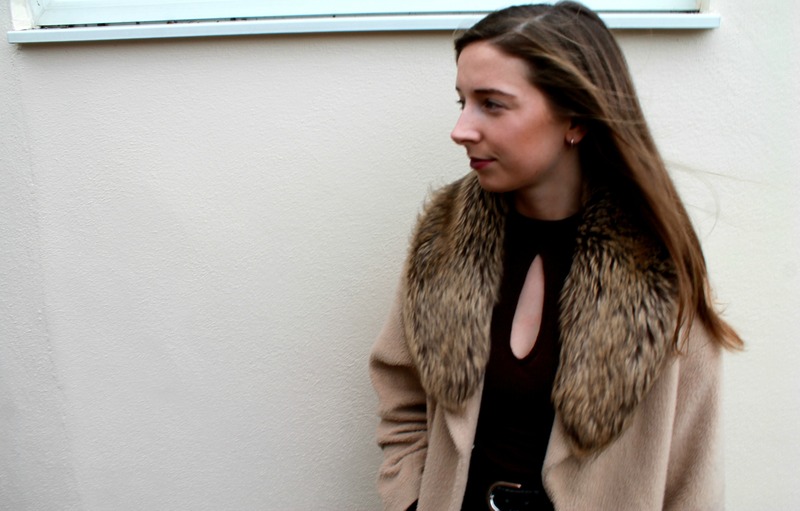 Today I have chosen an outfit perfect for any occasion, whether it’s for working in the office, drinks in the evening or even just going to the greyhound stadium and watching the dogs racing, which is where I wore this outfit last night! So I chose a top similar to the syle in my previous post with the high neck collar and cut out influence in an Autumnal maroon colour. The top coordinated well with a pair of high waist tailored trousers, held up by a silver buckled belt. I overlayed the outfit with a camel cocoon coat and a fur collar. Chic black ankle boots finished the outfit off with a black shopper bag but even a black clutch would work well. The perfect lipstick I found for this outfit was ‘Inhibition’ from Topshop’s beauty range which shadows a dark plum colour. Details about the outfit are at the bottom of the post.